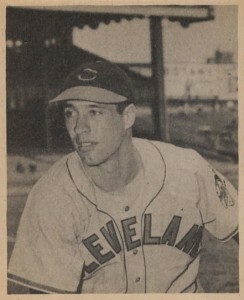 Bob Feller, the hardest throwing pitcher of his day, led the league in strikeouts seven times over his career and brought World Series success to the Cleveland Indians. In this top list, the best Bob Feller baseball cards are compiled, including his appearances in both pre- and post-World War II releases. Shop for Professionally Graded Bob Feller Cards on eBay. 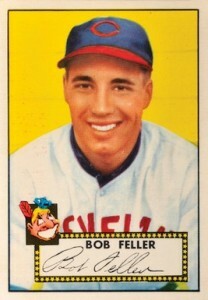 Feller debuted at the young age of 17 with the Indians and had possibly the quickest fastball of any pitcher in history. He also made a quick impression, becoming the first pitcher to win 24 games in a season before his 21st birthday. Adding to that, Feller would become one of the few hurlers to win the pitching Triple Crown (1940) and he would throw three no-hitters and, possibly more impressive, 11 one-hitters over his career. 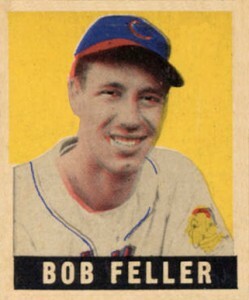 Feller helped the Indians win the franchise's second World Series title in 1948 and anchored the pitching staff that got them to 111 regular season wins on the way back to a second series trip in 1954. Some of the greatest hitters in baseball considered Feller to be the best pitcher they ever faced and it is hard to say how much more impressive his statistics would be if he hadn't lost nearly four complete seasons to his service in World War II. He finished his career with 266 wins and it might have been closer to 400 with those additional seasons during his prime. 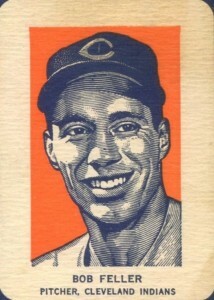 Bob Feller has many additional noteworthy cards that aren't featured below based of their extreme scarcity. Feller's debut card goes back to the 1936 Goudey Wide Pen set. As the name hints at, these picture cards are noteworthy for the wide pen used to create the facsimile autograph on each card. While is just too rare to justify including it on the list, it is a must-have for any die hard Feller fan. Feller is also included in every Bowman set of their original run from 1948-1955. Obviously, including every appearance from those eight sets would have made it practically a Bowman top ten, but each one is worth owning and it is a manageable collecting project to track down these appearances. Another first, in 1983, Authentic Sports Autographs issued a 12-card set called the Bob Feller Story which chronicled Feller's career and included his earliest certified autograph. If you are the sort of collector who enjoys collecting a rainbow of color parallels, you can do that with Feller's cards in 2012 Topps Tribute or 2012 Topps Triple Threads, which includes such colors as amber, emerald, and onyx. Additionally, the Topps Archives sets are always good for their unexpected design choices and you can find a Feller card with the 1986 Topps design in 2014 Archives and the 1976 Topps design in 2015 Archives. As one of baseball's best pitchers, nearly all of Feller's cards from his playing days have a high value attached to them. While card value was used as one of the main determining factors in constructing this list, card design and historical importance was also considered in each card's placement. 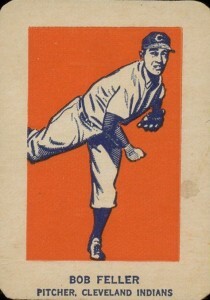 The cards included on Wheaties boxes in 1952 were simplistic compared to some of their offerings from the 1930s which often included complex baseball tips. Among the multi-sport athletes were ten baseball players, including Feller, and each had a portrait and action card. These cards were hand-cut from the cereal boxes, making the quality vary greatly from card to card. Cards #9 and #7 on this list are connected by showing similar Feller imagery, but offer two different styles that would dominate cards from the 1950s. 1953 Bowman has the groundbreaking color photography which made the set famous, while, as you'll see in entry #7, the 1950 Bowman set has some of the best painted cards ever produced. 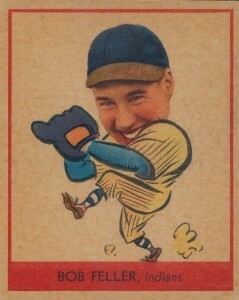 Feller's 1949 Bowman card highlights his birthplace of Van Meter, Iowa, which led to one of his famous nicknames, the "Heater from Van Meter." Along with that nickname, his fastball earned him two others: "Bullet Bob" and "Rapid Robert." Feller's 1950 Bowman card is certainly one of the most beautiful in the set as it shows him warming up along the dugout before a game. I personally love the level of detail for the people in the crowd and on the bench as many of the other cards in the set are close-up images of the players that do not include much additional scenery. 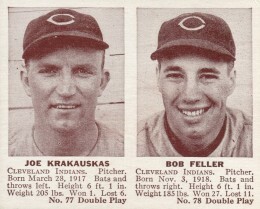 Feller shares his 1941 Double Play card with his Indians teammate Joe Krakauskas. Together, the duo combined for 35 wins during the 1939 season and, two seasons later, Krakauskas would gain a little notoriety by giving up Joe DiMaggio's 56th consecutive hit, which would prove to be the last of his famous streak. Looking at the 1952 Topps as a whole, most of the player paintings include the regular background from the photograph used for the card's inspiration, while a few cards went with a solid-color background instead. Feller's card is among the second group as he is given a bright yellow background the gives the card a sort of pop-art feel . Feller was included in many high-end card sets and he was also known for being a frequent through-the-mail signer, creating a large population of autographs for collectors to choose from. The autograph below is from 1999 Upper Deck Century Legends and features a photograph of Feller after he pitched his second of three career no-hitters. I particularly enjoy how the only color on the card is Feller's blue ink autograph. Although the 1948-1949 Leaf set has a checklist that includes cards up to #168, there are actually only 98 cards in the set. Of those 98 cards, half of those were short printed, including Feller's card #93. This was done to sell more packs as collectors searched and searched for cards that never existed and had no way to figure out what was really going on. 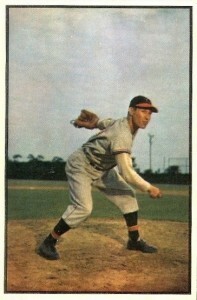 While the 1948-1949 Leaf set offered color, the 1948 Bowman offered better quality, black-and-white photography printing. 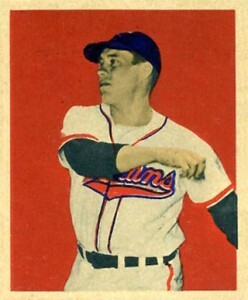 Feller's 1948 Bowman card is considered his official rookie card in some circles as his earlier Goudey cards had a smaller availability nationally compared to the Bowman sets. 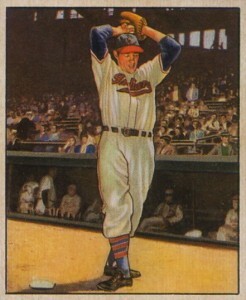 Like many stars at the time, Feller was featured on two different cards in the 1938 Goudey set. 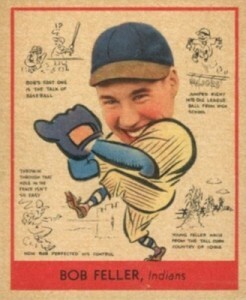 The cards are nearly identical except that the card included later in the checklist had small drawings and interesting facts added to the area around Feller's "big head." Feller's second card is also the final card in the Goudey set, giving the card a small value bump over his first appearance in the set.